The Recognizing Women’s Right to Vote in New York State online exhibit charts the development and evolution of the Women’s Suffrage movement in New York State. Early suffragists drew inspiration from native cultures and learned activism from other movements. As their movement coalesced, activists began practicing civil disobedience. Suffragists trumpeted their cause through a variety of media. Along the way, they faced divisive issues of race and strident opposition from male and female anti-suffragists. World War I demonstrated the importance of women’s contributions outside of the domestic sphere. 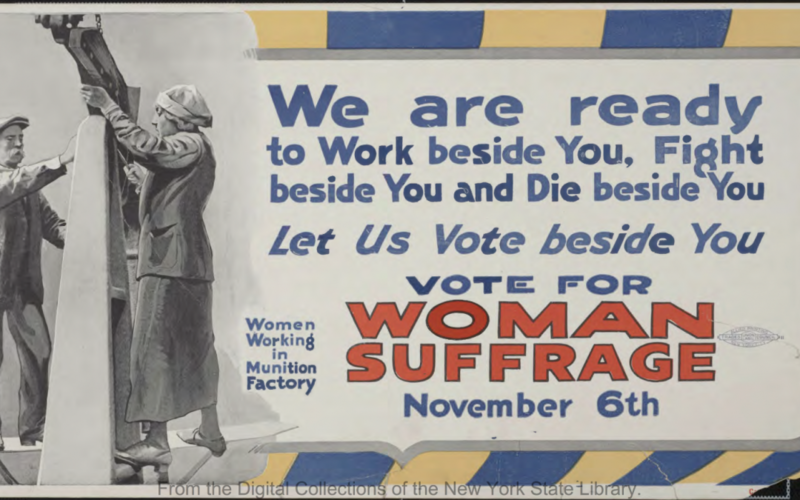 Women in New York State won the right to vote through a November 6, 1917 referendum. Soon members will be able to sign up to host the complimentary Women’s Suffrage Centennial traveling exhibition, which was developed with grant support from Humanities New York by the South Central Regional Library Council. The traveling exhibit explores different aspects of the Women’s Suffrage movement in New York, from pre-colonial times until the New York State referendum in 1917 and the 19th Amendment in 1920. Look for a special announcement when that exhibit is available.